The research and development of the Buckminster fuller institute compliments Panacea's proposals for sustainable living and ECO architecture designs. Further examples of these designs are covered in the ECO housing section of the site. Buckminster Fuller's awareness is related to environmental design science and ecology, and will also be submitted into the design of Panacea's proposed granted research and development centre. Below is a picture taken on July 16th in 1963. 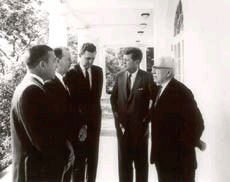 This shows Buckminister Fuller with President John Kennedy. 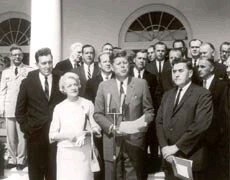 Below JFK announced his intensions to accelerate the construction of the Passamaquoddy Tidal Dam, this was JFK'S first step in his plan to eliminate the need for fossil fuel and nuclear power. Quote-Throughout his life, Fuller was concerned with the question of whether humanity has a chance to survive lastingly and successfully on planet Earth, and if so, how. Considering himself an average individual without special monetary means or academic degree, he chose to devote his life to this question, trying to find out what an individual like him could do to improve humanity's condition that large organizations, governments, or private enterprises inherently could not do. In the U.S. postage stamp commemorating Buckminster Fuller and his contributions to architecture and science, some of his inventions are visible. Most notably, his head is shaped after one of his geodesic domes. Other elements, such as futuristic cars, other craft and radar dishes are also present. Fuller wrote twenty-eight books, coining and popularizing terms such as Spaceship Earth, ephemeralization, and synergetics. He also created a large number of inventions, mostly in the fields of design and architecture, the best-known of which is the geodesic dome. Late in his life, after working on his concepts for several decades, Fuller had achieved considerable public visibility. He traveled the world giving lectures, and received numerous honorary doctorates. Most of his inventions, however, never made it into production, and he was strongly criticized in most of the fields that he tried to influence (such as architecture), or simply dismissed as a hopeless utopian. Fuller's proponents, on the other hand, claim that his work has not yet received the attention that it deserves. Fuller was most famous for his geodesic domes, which can be seen as part of military radar stations, civic buildings, and exhibition attractions. Their construction is based on extending some basic principles to build simple tensegrity structures, tetrahedron, octahedron, and the closest packing of spheres. Built in this way they are extremely lightweight and stable. 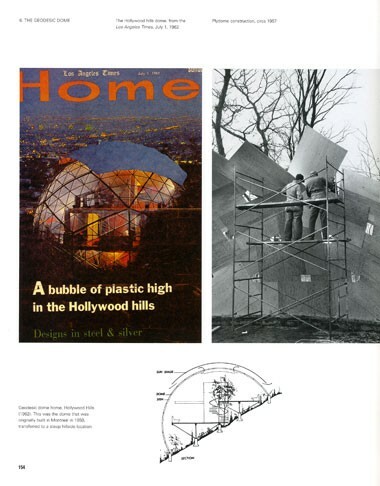 The patent for geodesic domes was awarded in 1954, part of Fuller's decades-long efforts to explore nature's constructing principles to find design solutions. Previously, Fuller had designed and built prototypes of what he hoped would be a safer, aerodynamic Dymaxion car - Dymaxion is contracted from DYnamic MAXimum tensION. To this end he experimented with a radical new approach. He worked with professional colleagues over a period of three years, beginning in 1932. Based on a design idea Fuller had derived from designs of aircraft, the three prototype cars were all quite different from anything on the market. For one thing, each of these vehicles had three, not four, wheels - with two, the drive wheels, in front, and the third, rear wheel being the one that was steered. The engine was located in the rear. Both the chassis and the body were original designs. The aerodynamic, somewhat tear-shaped body, which in one of the prototypes was about 18 feet long, was large enough to seat 11 people. It somehow resembled a melding of a light aircraft without wings and a Volkswagen van of 1950s vintage. The car was essentially a mini-bus in each of its three trial incarnations, and its concept long predated the Volkswagen Type 2 mini-bus conceived in 1947 by Ben Pon. Fuller's energy-efficient and low-cost Dymaxion houses garnered much interest, but have never gone into production. Here the term Dymaxion is used in effect to signify a radically strong and light tensegrity structure. One of Fuller's Dymaxion Houses is on display as a permanent exhibit at The Henry Ford in Dearborn, Michigan. Designed and developed in the mid 1940s, this prototype is a round structure, not a dome, shaped something like the flattened bell of certain jellyfish. It has several other innovative features, including revolving dresser drawers, and a fine-mist shower that reduces water consumption. According to Fuller biographer Steve Crooks, the house was designed to be delivered in two cylindrical packages, with interior color panels available at local dealers' premises. A circular structure at the top of the house was designed to rotate around a central mast to take advantage of natural winds for cooling and air circulation. Conceived nearly two decades before, and developed in Wichita, Kansas, the house was designed to be lightweight and adapted to windy climes. It was to be inexpensive to produce and purchase, and easily assembled. 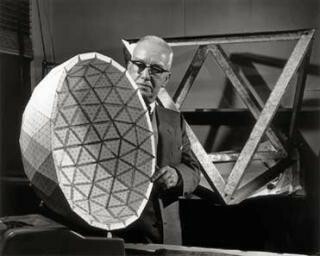 Buckminster Fuller made a radical commitment to understanding, discovery, and research. He wanted to be a trailblazer, which is a risky role in any field. His life and his work therefore constituted a kind of noble gamble. In keeping with the global perspective on human affairs, Fuller approached design problems comprehensively. Rather than attempt to redesign the house, he attempted to reinvent the whole housing industry. Instead of considering how to improve the conditions of cities, he declared the city itself to be obsolete. Instead of attempting to improve an existing model of automobile, he addressed the question of human transportation from first principles, emulating the design principles he observed in nature in his streamlined Dymaxion Car. Buckminster Fuller challenged us with a bold vision: "To make the world work for 100% of humanity in the shortest possible time through spontaneous cooperation without ecological offense or the disadvantage of anyone." The know-how and tools from a rapidly growing design revolution are available today to enable all people to achieve a quality standard of living while sustaining the health of our planet’s ecosystems. Nevertheless, humanity is on an accelerating course headed toward overwhelming the present carrying capacity of the planet. It is therefore of utmost urgency that our initiative be directed toward assisting and serving individuals, organizations and communities to address the vital and achievable design project that Fuller anticipated and humans now face. 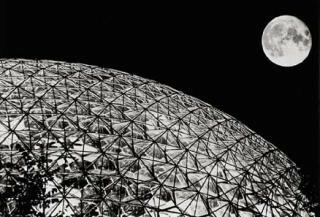 For complete detail of the Buckminster fuller institutes please visit and support their site. VWhitney Museum Co-curators Dana Miller and Michael Hays discuss Buckminster Fuller documentaries. Next is the suppressed energy device of Joseph Newman.